What warms the hands as well as the heart, especially on a blustery Autumn night? A nice cup of tea. How can you make a new acquaintance feel special or comfort an old friend? With a nice cup of tea. I love to drink tea. I like it strong and I like it hot! Recently, I received a gift from a friend who knows about my love affair with tea. 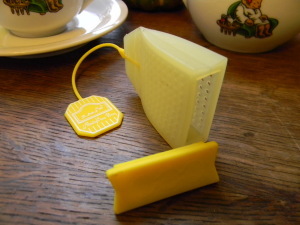 It is called an “Almigh’ Tea Bag” from Supreme Housewares. This cute little thing is made completely from silicone. It is shaped like a tea bag with tag intact! I’ve carried it to work with me and tried it out with several different cups and mugs. The base of the bag comes off so you can stuff the insides with your own mix of herbs and spices. Some like it strong, some like it light. With the Almigh’ Tea Bag, you can make it just like you want it. 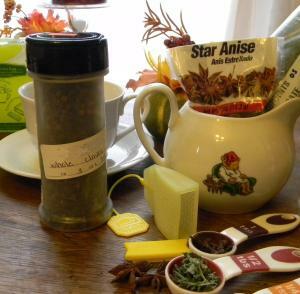 Here are some of the advantages that I found with this item as compared to the metal spoons or tea balls that you have in your utensil drawer at home. There is no metal to ruin your microwave. It travels well in your “go to work” mug. To clean out the tea leaves, simply turn it inside out. The leaves come out very easily. Small quantities as well as buying in bulk will save you money. No waste, even the used leaves can be added to the compost. 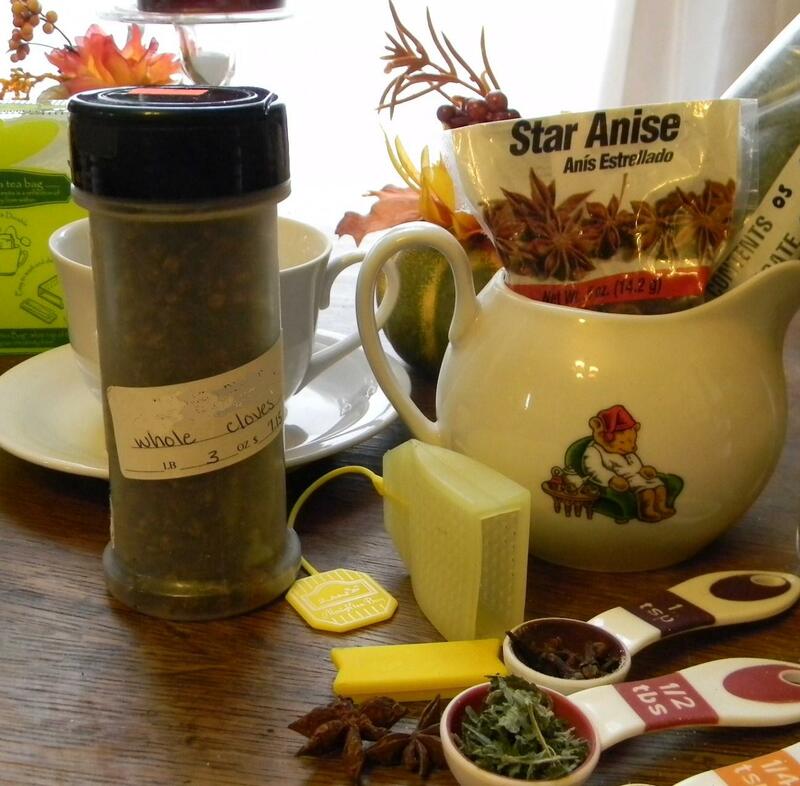 Fresh tea leaves and herbs give more robust flavor. You aren’t stuck with a whole box of tea in a flavor that you didn’t like. It is easy to experiment with flavor combinations. There are also other uses for this tool that are yet to be explored. I wonder how it will do for a small “bouquet garni” in a small beef stew? I also wonder how Coffee Beans will work, if they are course ground and stuffed inside with course ground hazelnuts? As you can tell, playing with this teabag may keep me occupied for some time. It is definitely an item that I will be adding to my stocking stuffer list for Christmas this year! The bag comes in four colors: yellow (shown), green, red, and ivory. 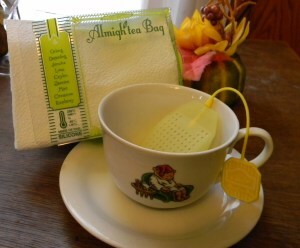 If you have any ideas about what can be stuffed into the “Almigh’ Tea Bag”, or have had any experience with it, I would love to hear from you. Please respond here or send an email to John at John@JohnMuellerBooks.com. There is fresh fallen snow outside my window as I write this and more on the way. In fact, it doesn’t look like gardening season out there at all. It’s a bit past the middle of winter, but spring is a long way off. However, this is the time of the year that Rebecca and I start thinking about the garden—mainly because our mailbox is bristling with seed catalogs. Of course, the seed catalogs end up in the house and we now have stacks of them in the living room, dining room, family room, bathroom, and even in our bedroom. We could possibly start our own catalog company by simply redistributing all the catalogs that are coming from various seed companies in the mail. Inside each catalog we see beautiful presentations of various vegetables and fruits. Given the time of year and the fact that our root cellar is becoming a bit empty, the idea of having fresh vegetables is quite appealing. Yes, canned and frozen foods will keep us quite happy and well fed, but there is nothing like picking that first asparagus spear (the first vegetable of the season) and preparing it for dinner. So, gazing fondly at the vegetables in the catalogs becomes the stuff of dreams for the upcoming season. However, before we can order anything, we need to know what the larder lacks. This means doing an inventory. Doing an inventory is no small undertaking. If we simply needed to create a list of items to grow, the inventory would be simple enough, but that’s not the end (nor even the beginning) of the task. As part of the inventory, we take down every jar, examine it for potential problems (such as a broken seal or rust on the lid that will eventually result in a broken seal). After that, we wash and dry the jar (remarking it if necessary). The jars are then repacked to ensure that the oldest stock is in the front. What all this work accomplishes is to ensure that what is on the shelf is actually edible and usable. The shelves can become disorganized during the winter months, so it’s essential to reorganize them so that any count we perform is accurate. During the process of working with the jars, we’ll begin to notice that some items are lacking. For example, this year we noted that there aren’t any beets left—not even the pickled variety (a favorite of mine). The pickled okra is also gone. However, we have a surprisingly strong supply of corn in various sized jars (for specific needs), so we probably won’t grow corn this year. I also found several jars of a wonderful blueberry compote Rebecca made for me. I had thought them gone when they were simply hiding behind some dill pickles. A well-stocked larder is a wonderful thing. You can go to bed at night knowing that you won’t go hungry—something far too many people in the world can’t say. It also provides you with high quality food of precisely the type you want. However, in order to maintain the larder, you must inventory it at least once a year (twice is better) and make sure that what you think you have is actually what you do have. Let me know if you have any questions about the inventory process at John@JohnMuellerBooks.com. Each year is different. It’s one of the things I like best about gardening and working in the orchard. You never quite know what is going to do well. It’s possible to do absolutely everything right (or wrong) and still end up with a mystery result. In the original Every Year is a Good and a Bad Year post, we had a combination of personal events conspire to derail the garden to an extent, yet we still ended up with an amazing crop of some items. This year it’s a combination of personal and weather issues. We had a really wet spring and the warm weather was late in coming. After attempting to plant our potatoes twice (and having them rot both times), we decided that this probably wasn’t going to be a good potato year. In fact, a combination of wet weather in the spring, a really late frost, a few scorcher days, followed by unseasonable coolness have all conspired to make our garden almost worthless this year. (A pleasant exception has been our brassicas, which includes items like broccoli.) Of course, that’s the bad news. The amazing thing is that our fruit trees and grape vines have absolutely adored the weather and a bit of a lack of quality weeding time. The pears are so loaded down that I’m actually having to cut some fruit in order to keep the branches from breaking. The grapes are similarly loaded. One vine became so heavy that it actually detached from the cable holding it and I had to have help tying it back into place. Nature is absolutely amazing because there is always a balance to things. A bad year in one way normally turns into a good year in another when you have a good plan in place. We keep seeing the same lesson from nature—variety is essential. When you create a garden of your own, you absolutely must plan for a variety of items to ensure that at least some of the items will do well and your larder will stay full. Eating a wide variety of food also has significant health benefits. Although you might read articles about the “perfect” food, there is in reality no perfect food. In order to maintain good health, you need to eat a variety of foods and obtain the nutrients that each food has to offer. It seems as if nature keeps trying to teach that lesson by ensuring that some items will be in short supply during some years. What sorts of items do you find are highly susceptible to the weather? Which items seem to grow reasonably well each year? Let me know your thoughts at John@JohnMuellerBooks.com. Every spring we start by planting some seeds for later transplant into the garden. The main reason for starting seeds in the house is that the growing season for the plant is too short if you simply plant the seed in the ground. It’s always a better idea to plant seeds directly in the garden when you can to avoid the shock of transplanting. However, many items, such as tomatoes and squash, need a longer growing time and you simply have to start them early. As a consequence, we’ve tried a number of planting trays over the years. A planting tray contains some number of individual cells that you use to grow plants from seed. When the time comes, you simply remove the young plant from the cell and plant it in the garden. This year we tried a new type of fiber planting tray, the Plantation Products P72HFB Clear Dome Fiber Tray with 72 Cell Insert. This particular product lets you plant up to 72 individual plants in a single tray. It comes with a clear dome that helps hold in moisture and give the seeds a better start. The clear dome also allows sunlight through, which naturally is a requirement for getting the seeds to grow. We actually use the really large rubber bands that come with file folders, orders from some companies, or the type you use for trash cans to hold the dome in place. Using a rubber band at either end keeps prying paws (those of our cats) out of the new plants. Of course, there are a number of systems out there and choosing the right kind for your particular needs can be difficult. There are a number of advantages to this system over using plastic trays. The cost of the trays is less than comparable plastic trays (although, the plastic trays do last several years and we don’t know yet just how long these fiber trays will last). The trays are completely biodegradable, unlike the plastic trays that have to be recycled (assuming they have the right recycling number on them, which many lack). The fiber actually absorbs excess liquid and releases it back into the soil, which makes it more difficult to over-water the plants. The trays seems sturdier and less likely to buckle. The fiber breathes better, which means that there is less likelihood of burning the tender roots—overheating the roots is a problem when using plastic trays. Longevity is the one potential issue that might make these fiber trays a little less of a value than they could be. The plastic tends to break if you don’t handle them with extreme care, but with careful handling it should last three or four years. We think we’ll be lucky to get two or possibly three years from the fiber trays we purchased. However, given the other advantages, the fiber trays seem like a good deal to us. You also have to be careful to get the product that comes with the watertight tray. The product packaging for the product we bought said that the base was watertight. Otherwise, using this product inside your home could lead to a watery mess. Of course, there are many different choices when it comes to planting trays, but most seem to come down to a choice between plastic and fiber. Let me know your thoughts on which is better, plastic or fiber, when it comes to planting trays at John@JohnMuellerBooks.com. One of the more amazing vegetables in the garden is the green bean. Green beans typically take little work to grow, produce well, and don’t appear to have many problems (with the exception of mold in wet years). We grow the bush variety because they don’t require a trellis. You can eat green beans in all sorts of ways—raw by themselves, cooked, in salads, and even fried. What most people don’t realize is that the uses of green beans don’t end there. You can also use green beans dried. Simply let the green bean stay on the plant until the shell is completely dry (usually after a few frosts). Dried beans have a significant advantage over other items you grow. Unlike most items, they require no preparation. You can simply pick them, put them in a bucket, put a lid on the bucket, and then stuff it in a cool, dry place. That’s it! The beans will stay good almost indefinitely. I just finished shelling the last of our dried beans from last year. There was no deterioration of the bean whatsoever. Rebecca will use them in baked beans, soups, and in salads. Dried beans are also quite high in nutrients, making them a great food value. For example, if you make them into baked beans, a single serving supplies 28 percent of your daily requirement of iron. Before I get e-mail about the relative merits of other vegetables, yes, you can store root vegetables such as potatoes in your basement without doing anything special to them. In addition, winter squash also lasts quite well in the basement without any special preparation. However, in both cases you face the problem of having to use the items by February or (in a good year) March. The winter squash tends to start rotting by that time and the potatoes start to get soft in preparation for sprouting. Dried beans appear to have no such limitation. Of course, the big thing is to ensure that the bean really is dried. We keep the beans on the plants until late fall after a few frosts have killed the plant completely. The beans should rattle within the shells when shaken. The outside should be a nice tan color in most cases and should feel quite dry. The shells will also be a bit on the hard side, rather than soft as a green shell will be. Don’t worry if you see a bit of discoloration on the shell. That’s normal. If you see a little discoloration, shell a bean or two to see for yourself that the beans inside are shiny and that the skin is intact. Even if the bean is a little dirty, it’s acceptable to use as long as the skin is intact. The one thing you must do before using beans you dry yourself is to wash them. The beans do pick up a few contaminants during the drying process. You don’t use soap and water. Just place the beans in a colander and rinse thoroughly. Make sure you move the bean around and get all of the dirt off. When you see that the water is coming out of the colander without any dirt, the beans are probably clean. The bean is one of those items with a nearly unlimited shelf life that’s both nutritious and delicious. The fact that you can use them green or dry, raw or cooked, makes them exceptionally versatile. Even a small garden has space for some of these marvelous plants. Let me know your thoughts about beans (both green and dried) at John@JohnMuellerBooks.com. Nothing is quite so good as a delicious ear of corn picked fresh from the garden. A freshly picked ear of corn is sweeter and more delicious than any ear of corn you’ll ever taste. The fresher the ear, the more delicious the taste. Of course, that delicious ear of corn starts with the correct planting technique and choice of corn variety. We happen to prefer the Bodacious variety because it produces evenly colored corn with a great taste. The ears are normally full (indicating good pollination), the stalks don’t seem to break quite as often, it’s a little less susceptible to pests, and we find that the ears are often larger. We’ve also tried a number of other varieties such as Kandy Corn (somewhat sweeter) and Serendipity Bi-color Corn (interesting color combinations and ripens somewhat earlier). So far, we like Bodacious the best, but you need to choose a corn variety that works well in your area. Take factors such the type of soil, variety of pests, and weather into account when making your choice. Planting the seeds correctly is also important. We have quite a bit of high wind in this area, so we plant the seeds one foot apart in rows and each of the rows two feet apart. If you plant the corn seeds too closely together, the corn won’t ever produce a strong stalk. In fact, a worst case scenario is that the corn won’t produce any ears. Planting the corn too far apart makes the stalks more susceptible to wind damage and reduces pollination. You may get full sized ears, but you won’t get ears that are full of kernels. You may have to plant your corn differently depending on your area to get optimal results. The tough part is figuring how when to pick the corn. Yes, you see the ears pop out sometime after the corn tassels (corn cross pollinates through wind action—it doesn’t depend on a pollinator to pollinate it). The tassels are the male flowering member of the plant, while the kernels (ovules) are the female flower member of the plant. These female members reside in a husk and sent out silks to receive the pollen. Pollen travels down the silks to the ovules and pollinates them. Each ovule requires individual pollination, which is why you can see ears with only a few kernels or you can see one or two ovules that didn’t pollinate in a given ear. The point is that the pollination occurs, the kernel grows, and then there is a magical period when the kernels are full of delicious sugar-filled liquid that is absolutely delightful to ingest. After that, the sugars begin to turn to a less tasty starch. The silks are part of the key to discovering when to pick the corn. When the silks whither and turn black, you know they have done their job—the kernels are pollinated (or at least as pollinated as they’ll get). However, the kernels aren’t instantly fully sized. The dying silks tell you that pollination is over and that you’ll soon have tasty corn to eat. The next clue is to feel the ears. Gently place your hand around an ear and you can feel the kernels growing. It takes a while, but you’ll eventually developer a touch that tells you that the kernels are getting larger. At some point, you’ll stop feeling any growth. In addition, the ears will feel solid, without any gaps between kernels. At this point, you can peak at the ears. Gently pull the husk back to reveal the tip of the ear. The kernels at the tip develop last, so the kernels at the bottom are always riper and fuller than the kernels at the tip. When the last few rows start the look the right color and fullness, try sticking a thumbnail into one of the kernels. If you see a liquid come out, the corn is ready to pick. If there is no liquid, carefully smooth the husk back over the ear. It should ripen normally within a day or two. Of course, sometimes the kernels at the tip of the ear aren’t pollinated or may not grow right for other reasons. Sometimes a corn borer ruins your day. Earwigs are also a problem at times (and beneficial at others). Never allow the corn to stay on the stalk for more than a week after you feel full ears. If you have doubts, pull one ear, fully husk it, and evaluate the results. Cutting the kernels from the ear and trying a few raw will tell you quite a bit about the status of the corn. Sweetcorn—it’s the stuff of summer. What are your experiences with corn? Do you grow it yourself or get it from a roadside stand? Let me know at John@JohnMuellerBooks.com. Last year I noted in my Okra Pollination Problems post that our okra had serious pollination problems—that the flowers were simply drying and falling off. What a difference a year makes! This year we moved the okra completely away from the tomatoes. Suddenly, there are all kinds of ants on the plants and the flowers are opening up as they should. In fact, we’ve already picked quite a bit of okra, which is one of the few bright spots in our drought impacted garden this year. After talking with quite a few people about the issue, I’m becoming convinced that the okra flowers must have some sort of wax on them, much as other flowers such as peonies do. The ants are necessary to eat the wax off and help open the flowers. In addition, the ants must act as the pollinators. I haven’t seen much in the way of bee or other flying insect activity around these flowers to date and I’ve spent quite a bit of time watching. If someone else has an opinion about pollinators for okra, please contact me at John@JohnMuellerBooks.com. The okra plants also seem to be responding well to heat. We’ve had to water them, but the plants are growing normally despite the heat (as contrasted to our tomatoes that don’t appear to want to grow much at all). I’d be interested in hearing other experiences with okra when it comes to summer heat. Given that this has been a hotter than normal summer (breaking all sorts of records), it’s a good test of what will happen when climate change starts to take a fuller effect. Okra seems to be on our list of items to maintain despite the heat. The one thing we have noticed is that we’re having to be a little more diligent than normal in monitoring the okra. The individual spears are growing faster than normal and it’s possible to see a smallish okra one day that turns into something a bit too large the next. When okra get too large, they also get woody. You don’t want to pick them too small, but too large definitely presents problems. We normally pick the okra when it reaches 2 inches in length. That size seems to provide a good tradeoff between getting enough value for the time invested and not having a woody result. How is your okra growing this year? For that matter, how is your garden doing as a whole? Let me know at John@JohnMuellerBooks.com.